Normal wear and tear due to age can cause stenosis of the spinal column, according to the American Academy of Orthopedic Surgeons, or AAOS. This occurs because the small bones and discs in the back may degenerate and cause narrowing of the spinal canal. According to the AAOS, arthritis is the most common cause of spinal stenosis. A patient with spinal stenosis may experience crippling symptoms that require medical treatment in order to improve quality of life. According to MedlinePlus, weakness of the legs may occur with spinal stenosis. 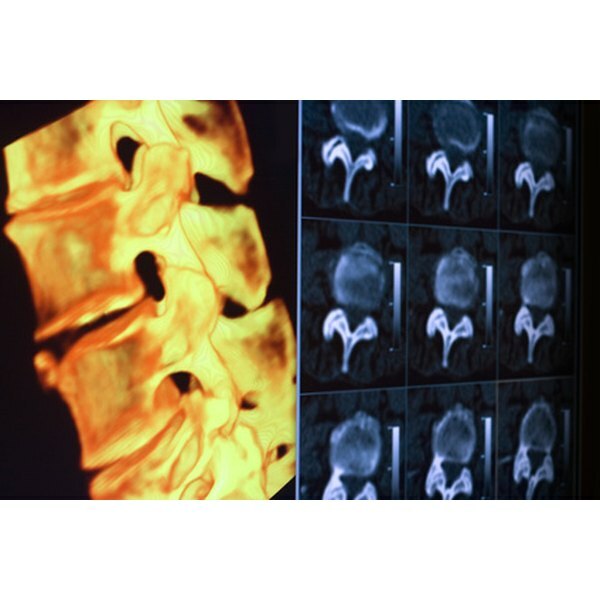 Weakness occurs because bone spurs or discs in the back my compress the spinal nerves as they exit the spinal column. This compression may reduce the motor signals sent to the muscles, reducing their ability to move. Weak signals result in trouble lifting the toes in the air, extending the knee, or elevating or flexing the hip joint. Weakness can make walking and standing difficult for a patient. Therefore, prompt medical treatment is necessary for the patient to regain strength in his legs. A patient with spinal stenosis may notice severe crippling deficits in balance, according to MedlinePlus. A patient may have difficulty in balance because nerves in the spinal cord may be compressed by bone spurs or degenerating disks. These nerves, called proprioceptive, are responsible for sensing balance in the lower extremities. If these nerves are affected, a patient may have difficulty walking or standing because of lack of balance signals in the lower extremities. This is a more severe sign of spinal stenosis, which requires immediate medical or surgical treatment so that balance signals can be restored. According to the AAOS, patients with spinal stenosis may experience a crippling type of burning pain in the buttocks or legs, called sciatica. Sciatica results from bone spurs or degenerating disk compressing the spinal nerves as they exit the spinal column. This compression can affect sensory signals in the nerves, which is sensed as a constant ache or burning feeling that typically starts in the buttocks and moves into one or both legs. As the pain worsens, a patient may have difficulty walking, which can be crippling.